Green pea flour is not an easy going ingredient. It is mostly used only in making cookies....as far as I know! 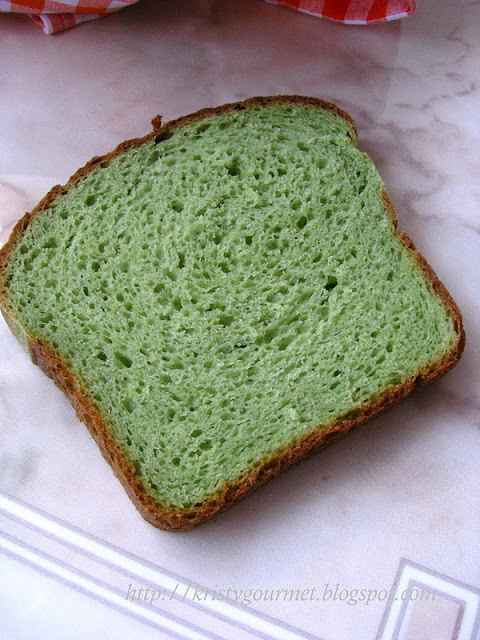 Other than that I don't think I see much recipes on it.....but I'm lucky enough to have found one bread recipe out from Baking History site, which is made of green pea flour. I am truly honoured to try this recipe out. And here's what I did. (1) combine ingredients (A) and set aside for 30mins. (2) combine ingredients (B) and set aside for an hour or till double in size. (3) then stir ingredient (A), (B) & (C) and mix well, till foam a soft dough. (4) set dough aside for an hour or till double in size. (5) once it's ready, place dough onto a slightly floured working table. (6) knead dough till smooth then roll out flat, next roll it into swiss roll shape. (7) place rolled dough to a 4x9" pan and set aside for 30-45mins or till nicely rose. (8) finally, bake at preheated oven 190'C for about 45mins or till nicely brown. (9) leave cool completely before slicing. The green pea colour looks simply beautiful. It has a very light & tempting flavour of green pea on it. For vegan blogger, you may omit the egg and replace it with another 30ml of milk/water. Just a reminder, the texture of this bread is more likely to the American style or French style. It's springy & dense....not soft and fluffy. And it's also perfect for making panini. So, what do you think! Would never have thought to use green pea, but this is fantastic! I did wonder how you managed green pea bread... green pea flour? Amazing! I must say it looks grand and would be a natural for St. Patrick's Day in the states! Kristy, you are truly the master of innovations! 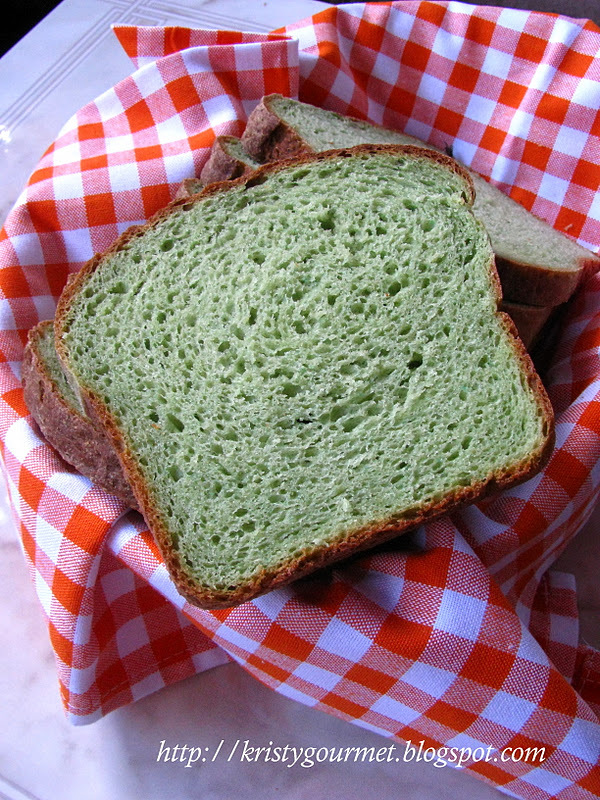 This green pea bread is very unique and looks so nicely baked too! Bravo! 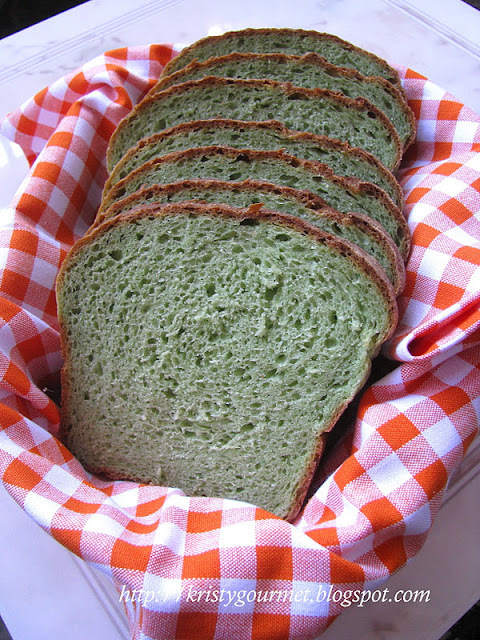 another creative job from you, just wonder how it taste with green pea flour in a bread. I really like the colour of the bread but i don't think i've seen green pea flour before. Beautiful crumb! Love tea flavour. are you saying these are the green pea flour that we used for making the cny grren pea cookies? this is very interesting and special! Just tried your pea bread: wonderful. I needed to add a lot of flour (maybe 2 cups) to get to a proper kneading consistency, and therefore mine is less green. Next time, I'll reduce the liquid at some point. There WILL be a next time, as it is really good. Welcome to my humble little space and glad you tried this bread. Looking forward to hearing from you more often. may i know if the green pea flour is the same as the green pea powder which we use to make the green pea cookies for chinese new year? also can i use bread machine to make this bread? First of all, welcome to my humble little space. To your question, yes, it is exactly the green pea powder we used for making cookies. You may use the bread machine but you need to follow the quantity & size as given by the machine description.